A key part of the Democratic coalition is not feeling the same enthusiasm for the midterms as other groups. SAN ANTONIO — Voters are more invested in the 2018 elections than in any recent midterm. But a key piece of the Democratic coalition — Latino voters — is lagging behind other groups in its interest in the 2018 campaign, an enthusiasm gap that could tip the scales in key battleground House districts. Latinos make up at least 20 percent of the population in more than a dozen districts that top Democrats’ House target list in 2018 — more than half of the 23 seats Democrats must flip to take over the House. But a POLITICO analysis of over 20,000 interviews conducted with battleground-district voters by Siena College and the New York Times shows that Latinos rated themselves less likely to vote than both white and black voters. Two-thirds of white voters surveyed said they were “almost certain” to vote — the highest rating on a 5-point scale — as did 61 percent of African-Americans. But only 55 percent of the Latinos polled said the same about their plans for next month’s midterm elections, according to POLITICO’s analysis. The findings — echoed by other public and private polling from groups like Latino Decisions, a Latino-focused polling and research firm whose latest survey showed that more than half of Latino voters have yet to be contacted by a campaign or party group ahead of the midterms — could have an outsized effect in a crescent of battleground House districts running from Texas to the West Coast, where the Hispanic vote is especially important. Democratic operatives are concerned that Latino engagement is “better than it was in 2014, but not as strong as 2016, and we need closer to 2016 enthusiasm level to flip many of these seats in Texas, California, Florida and Nevada,” said Josh Ulibarri, a Democratic pollster who works on races throughout the country. The problem could be particularly acute in California, where Democrats “should absolutely be worried about Latinos,” said Paul Mitchell, a nonpartisan data consultant. Latinos comprise at least 20 percent and up to two-thirds of the population in seven contested California seats, making them “one of the most important factors for Democratic success,” Mitchell added. POLITICO analyzed the Latino vote by aggregating responses to 40 House polls conducted by the New York Times and Siena College, yielding over 1,700 interviews with Latino voters — an unusually rich and detailed portrait of battleground-district Latinos. The surveys showed House Democrats leading by 13 points among Latino voters but yet to convince more than 10 percent of the group that remains undecided, even though those undecided Latinos disapprove of President Donald Trump by a 3-to-1 margin. Democratic efforts to persuade them to vote for the party’s candidates could make the difference in numerous districts. Struggling to activate Latino voters — who are often younger and more transient than voters from other racial groups — during non-presidential elections isn’t a new problem for Democrats. In 2014, former Rep. Steven Horsford (D-Nev.) lost his House seat, where Latinos make up nearly a third of the district, after midterm voter turnout bottomed out. The Democratic Congressional Campaign Committee has poured $ 25 million into heading off a Latino turnout problem, investing the money into turnout efforts targeting unlikely voters who would support Democrats if they participated, including Latinos. 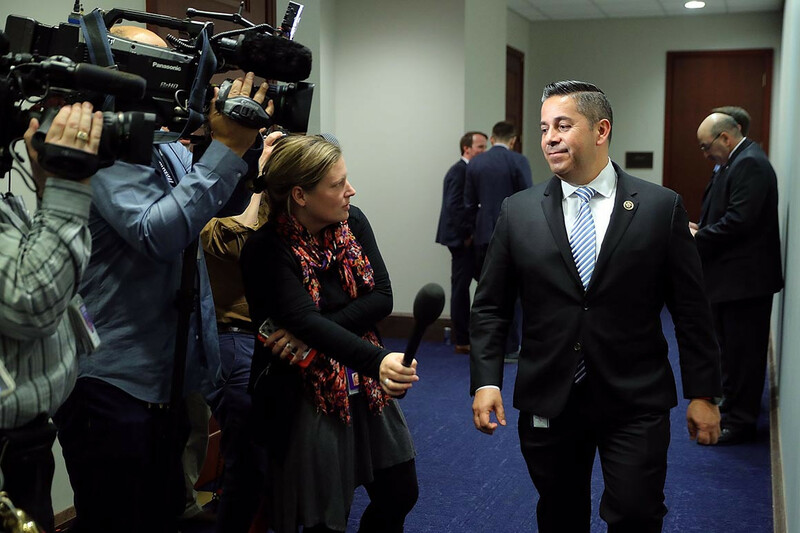 The committee — which is led by two Latinos, Chairman Ben Ray Lujan and executive director Dan Sena — has aired dozens of Spanish-language TV and radio ads on districts across the country and supported Latino field directors in 29 House districts. A DCCC aide also pointed to the June primary results out of districts like California’s 39th as evidence showing that their investment has paid off already. Latinos there made up about one-fifth of the vote share in the primary for that seat, a top Democratic target, just slightly down from Latino turnout in the 2016 presidential primaries and nearly doubling the group’s participation from the last midterm year. The DCCC launched its first Spanish-language ad there to boost Democrat Gil Cisneros in May. The catch: Latinos make up nearly two-thirds of the district’s population, and their vote share is far outweighed by other groups with less population power. Another of those Democratic candidates airing frequent Spanish-language ads is Gina Ortiz Jones, who’s challenging Rep. Will Hurd (R-Texas) in a district that’s 70 percent Latino, stretching hundreds of miles from the San Antonio suburbs into far West Texas. “We’re showing up, and I must admit, they haven’t seen a Democrat in a long time,” Ortiz Jones said, adding that sees that “enthusiasm is high” when she’s on the campaign trail. Ortiz Jones, along with Democratic pollsters, also emphasized that Latinos are notoriously difficult to survey. But so far, Hurd continues to lead in public and private polling shared with POLITICO. “If [Hurd] didn’t lose in 2016, it’ll be very difficult to take him out in a midterm year,” said Matt Barreto, the co-founder of Latino Decisions. The ingredients for a boost in Latino turnout already exist in 2018. Two-thirds of Latinos said they want to see Democrats controlling Congress and just a quarter of those voters approve of President Donald Trump’s job performance, according to an NBC News/Wall Street Journal/Telemundo poll released last month. Candidates and Latino groups alike stressed that they can increase turnout among Hispanic voters with aggressive contact. Latino Victory Project, a group that works to elect progressive candidates, pointed to primary results in Texas and in Florida, where Democrat Sylvia Garcia amped Latino turnout by 225 percent tow in her primary and Rep. Darren Soto (D-Fla.) doubled it in his race. But some say it could be too late to make a difference in the general election. Back in San Antonio, a Texas Organizing Project canvasser handed out pamphlets in heavily Hispanic neighborhood, encouraging voters to support Ortiz Jones and other Democratic candidates in the state.